WASHINGTON — There were 13 chairs lined up on stage behind Hillary Clinton’s podium here Monday night, one for each Democratic woman in the Senate — except one. The notable no-show was Massachusetts Sen. Elizabeth Warren, the progressive icon whom liberal groups spent more than $1 million trying to draft into the 2016 presidential race against Clinton this year. The stage setting was emblematic of Clinton’s campaign, which has managed to round up the vast majority of the Democratic Party’s elected officials into her camp, and especially colleagues of her top rival for the nomination, Sen. Bernie Sanders (who underwent hernia surgery Monday). The 13 women had already endorsed Clinton, along with most of the Democrats in the House. 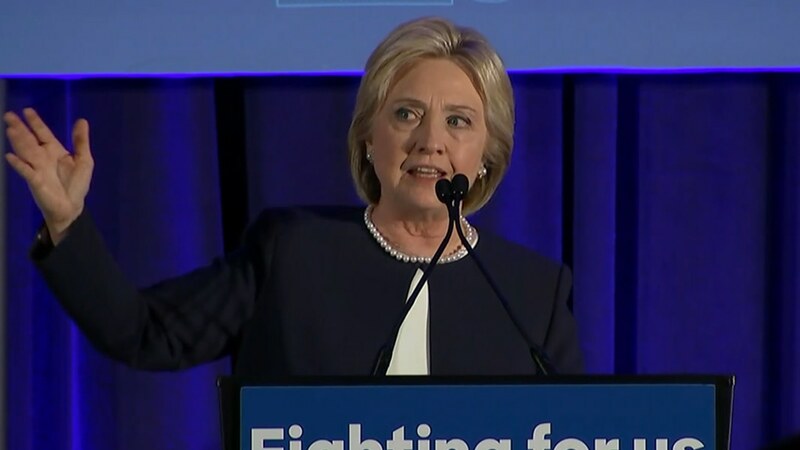 And at Monday’s fundraiser, one of the largest of her 2016 campaign, Clinton likely raked in hundreds of thousands of dollars from the 1,000 attendees, which included other members of Congress, wealthy donors, and prominent Washington Democrats. But Warren’s absence spoke to a question that has nipped at Clinton’s heels throughout her campaign: Will her overwhelming support from the party’s establishment be matched by enthusiasm among the party’s grassroots base? Warren was invited to participate in the fundraiser, but did not attend because she is not yet backing Clinton or any candidate in the 2016 Democratic primary. 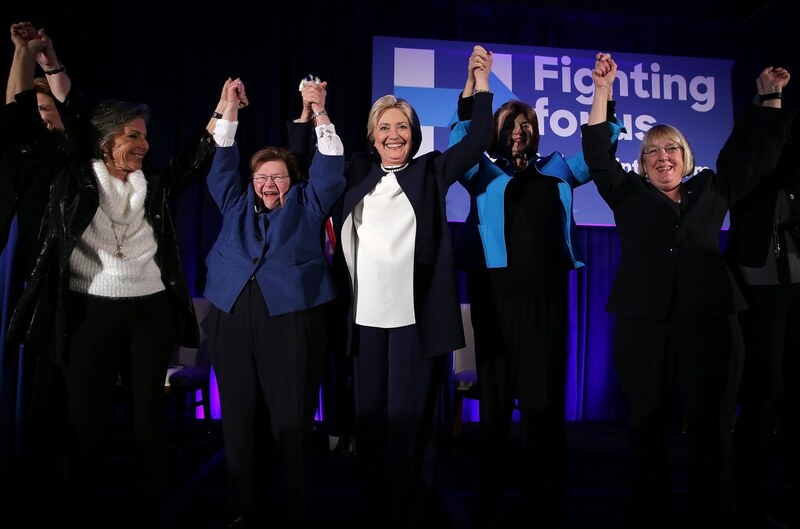 “We’re honored to have 13 women Senators coming together to endorse and support Hillary Clinton. 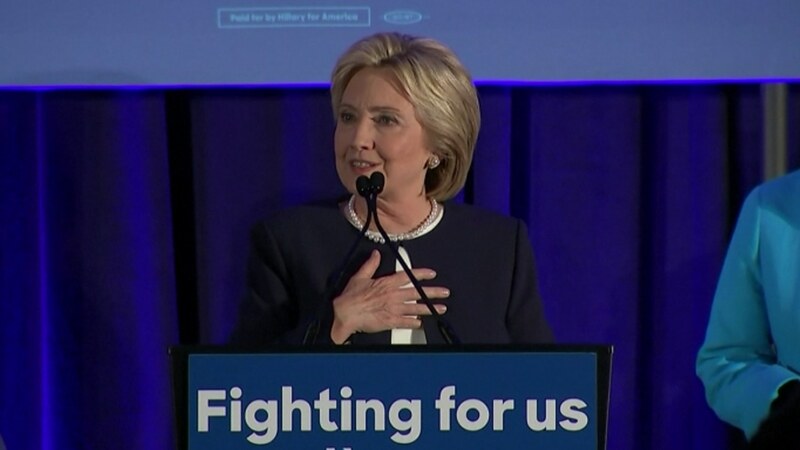 This is a sign of the broad support Clinton is receiving from women across the country who know she’ll fight for us,” said Clinton campaign spokesperson Christina Reynolds. Sanders has captured the voting bloc that would have been Warren’s had she decided to run, but he has so far struggled to expand his support beyond that — especially among his party’s leadership. He is the lone member of the Senate supporting his presidential campaign, and he has just two members of the House in his corner. Sanders has attempted to play this to his advantage. “Now is not the time for establishment politics, now is the time for a political revolution,” he said at the New Hampshire Democratic Party’s Jefferson Jackson dinner Sunday night in Manchester. An endorsement from Warren, who is one of just six Democrats in the upper chamber who has yet to back Clinton, would be a powerful validator for either candidate. Earlier this year, while weighing a potential White House bid, Vice President Joe Biden met with Warren for what she called “a good, long, rambly conversation” at the Naval Observatory. Clinton’s backers are convinced she’ll come on board eventually. “Elizabeth. I think in her course of time, she’s going to come out for Hillary,” California Sen. Barbara Boxer told MSNBC’s Steve Kornacki Monday afternoon. Aides to both Clinton and Warren seemed to chafe at the latest round of questioning from reporters about the relationship between the two women, which has existed in some form since Warren visited then-first lady Clinton to lobby her on a bankruptcy bill in the 1990s, but has never been particularly close. Warren has been publicly pushing presidential candidates to support a bill that would put restrictions on the so-called “revolving door” between Wall Street and government, and is a force in the Senate for stricter rules on the financial industry and consumer protection. 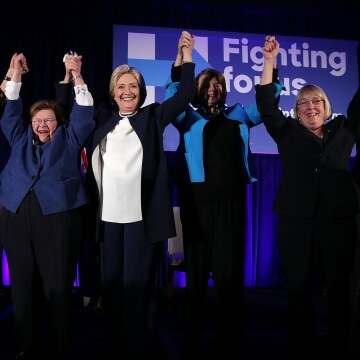 In 2013, all 14 Democratic women senators — including Warren — signed on to a letter organized by California Sen. Barbara Boxer urging Clinton to run for president. Warren has said calling on Clinton to run is not the same thing as an endorsement. The senator is still not ready to make an endorsement, Warren allies say, though she has indicated she will do so before the Democratic contest is over. “I imagine that’s what I’ll do,” she told The Boston Globe when asked if she would endorse during the primary. Despite the conspicuous absence of Warren, rarely has Clinton’s lock on the establishment support been so clear as it was Monday night. Speaking to room packed by Washington notables, 13 of Sanders’ colleagues spoke back-to-back about why they were choosing their former colleague over their current one, though none of them mentioned him by name. New Hampshire Sen. Jeanne Shaheen, who previously served as governor and whose political apparatus has been put to work for Clinton, vowed that the former secretary of state would win her state’s critical first-in-the-nation primary. “Hillary’s going to win New Hampshire,” she said. Following Shaheen, Sen. Amy Klobuchar joked she can see Iowa from her porch in neighboring Minnesota. “And I can tell you this. Hillary Clinton is going to win Iowa!” she said. The majority ofthe senators cited Clinton’s foreign policy experience as a reason for backing her, often highlighting her tenure as secretary of state. The women also drew sharp contrasts between Clinton and Republican presidential candidates. And all of the senators said it was time for the country to elect a woman president, and the campaign unveiled a new video titled “44 Boys Is Too Many,” which featured girls saying the same. Clinton touched on the theme earlier in the day during an appearance at the Atlantic Council in Washington in which she discussed foreign policy. “It would be probably predictable for me to say this but there’s a lot we can learn from Latin America’s success at electing women,” she said.